Bone Morphogenetic Proteins (BMPs) belong to the TGF-β (Transforming Growth Factor) superfamily of structurally related signaling proteins. BMP2 is a potent osteoinductive cytokine, capable of inducing bone and cartilage formation in association with osteoconductive carriers such as collagen and synthetic hydroxyapatite. In addition, BMP2 plays an important role in cardiac morphogenesis and is expressed in a variety of tissues; including the lung, spleen, brain, liver, prostate, ovary and small intestine. The functional form of BMP2 is a 26kDa protein composed of two identical 115 amino acid polypeptide chains linked by a single disulfide bond. Biological Activity: Fully biologically active when compared to standard. 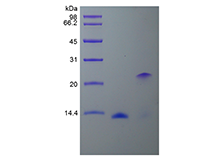 The ED50 as determined by inducing alkaline phosphatase production of murine ATDC5 cells is less than 200 ng/ml, corresponding to a specific activity of >5.0×103 IU/mg.